The hammock is not only for external use but also an hanging bed for the indoor, to hung within the home, to the walls or the ceiling. The hammock, always holds a special place in the imagination of each as a recall to relax, to rest, to the gentle rhythm and cadence of the swing granted by the use of this type of bed, of quite ancient origins. It was introduced by the Indio Latin America who called it cradle of the gods, then it was spread by Christopher Columbus among the sailors, in ships, as a way to relax, fall asleep on the sinuous shape of the waves, then lift off the hard floor of the ship that, however, was also dirty. Over time, the hammock has undergone significant developments improving in the material, in detail, the design with models of various types, shapes and colors, optimizing ever more the relationship between tradition and modernity. Nevertheless, the idea of including an hanging cot in the home becomes practical if you have a garden, an open space of considerable size, a large balcony, in short, only in external situations and rarely in rooms, indoor. In fact, the indoor hammock, inserted in an interior, maybe in the living area where you can indulge in a moment of rest after lunch or in the evening, harmonizes the atmosphere and customize the area of living in a truly special and unique space. 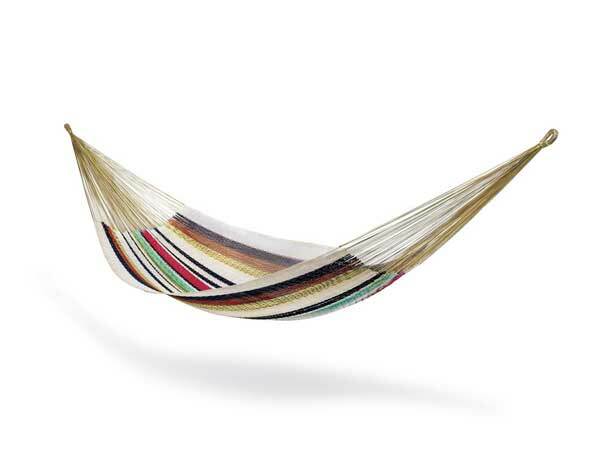 In the image above we see the hammock Luna by Missoni Home, for two, a 100% nylon woven threefold. Nowadays, in the market there are different types of hammock, suitable for both outside and inside, from the more traditional which require the coupling to two vertical supports such as two trees or two walls, to the more contemporary which are equipped with ground support. The hanging cot is usually made in cotton, a resistant material, absorbent, great for the contact with the skin because it ensures the passage of air, and therefore breathable, substantially soft. There are variants of synthetic fiber polypropylene, the material dries quickly and therefore is especially suitable for outdoor use where you need to have a fabric that doesn't get damaged by the rain, humidity, sunlight, the elements. Other models are especially suitable for travelers, are made in polyamide, durable fabric, lightweight, easily foldable, therefore, saves space, anti-tear, smooth to the touch, breathable. About the size, there are small for one person, about 140 cm in width, medium which can accomodate two people and then 160 cm, great for two or three people with a width of 180 cm. 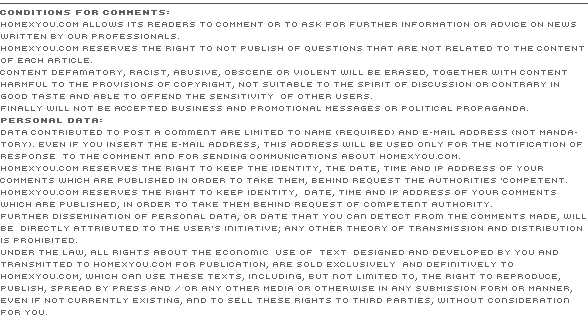 By varying the size in width, they are also modified measures concerning the space between the two support points and the height where it is docked. The hammock placed in an apartment, especially in the living area, in the area of house which is more lived and savored, it relaxes the mind already at the first sight, conditioning in a positive way from a psychological point of view, it invites to relax and to take the well known siesta. Try to imagine a hammock placed before a fireplace, a pellet stove, laying down enjoying the sinuous and light rocking, the warmth of the home reading a book or viewing your iPhone with confidence. 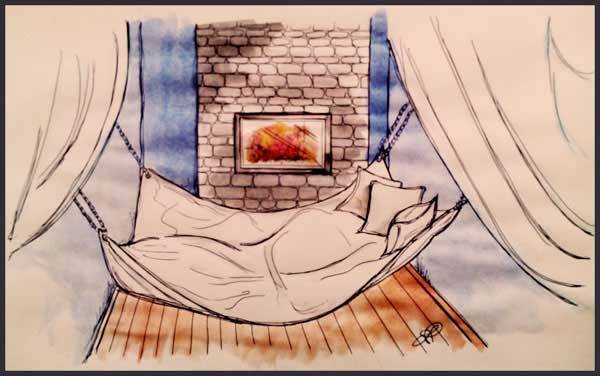 In the image below, you can see a hammock placed in front of a fireplace, in respect of the safety distance, neutral colors, with soft and fluffy linenes, then with the addition of other accessories designed to turn the seat into a real hanging bed complete with pillow, sheets and light duvet. It is of great size to accommodate more than one person, so thought for a family, as a double hammock. It's hooked to the two vertical walls and raised off the ground of about 30 cm. Behind, the fireplace is framed by a dividing wall, covered with stones, that protrudes from the rear surface, creating a game of volumes, elegance and tradition, contemporary and versatile living space. Artificial lighting in warm colors, scented candles, crackling wood, furniture, in support of appetizers to taste, makes this corner space really valuable. A small observing note to do is about the position that we usually take when we lie down in the hammock that is to lie down along the long side, running the risk of getting wrapped up in the fabric and be unable to see anything of what is around, rather than lay down obliquely, diagonally, in order to keep apen enough the fabric the hammock is made of and optimize the swing movement. To hang a hammock you must be evaluate and determine what should be the appropriate points for the attachment that, if in an apartment, may be two vertical walls or the ceiling. The most suitable walls walls are those made of concrete or brick where are applied the specific hooks that allow you to tie the ropes of the hammock, the hooks usually have four screws, as you can see in the image on the side. In case you want to hang your hammock in plasterboard walls, usually not prepared to support great weights, you must put a reinforcement, an additional support, as upright, useful to support a considerable weight. For this operation, it is preferable to leave it to a technical expert who can advise the exact support needed to support the object to be attached. After having chosen the supports, it should evaluate whether the space that you have available is sufficient for the extension of the hammock or not. Consider, therefore, that the height of the suspension should be for the most half the width generated by the points of support, of attack, in order to obtain a correct bending of the fabric. 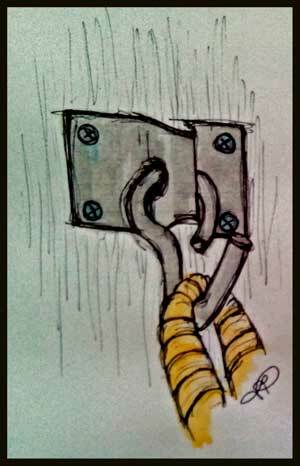 In the market there are, however, also types with a smaller bulk and that sometimes require coupling to a single wall. 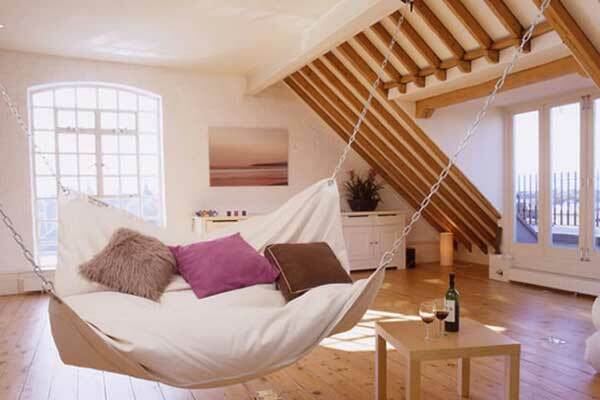 To hang the hammock to the ceiling, it must be shorter than than traditional 270cm, therefore spaces where it is allowed to have a useful height of 240cm and characterized by the presence of beams which support the expected weight. In conclusion we can say that the indoor hammock is a piece of furniture that gives a scenic impression, funcyional to relax and point of visual attraction for its aesthetics. Now you just need to choose the model that you like, the color that best matches the situation and swing dangle shaking off the frantic pace of contemporary life. Valutation: 5.25 / 6 on 4 votes.